Want to find out what we've been up to throughout the year? Here's the place! Information about events and news items are organized by semester. We try to add pictures when we can so if you have pictures from Office events please send them to sustainability@cofc.edu! For up to date news and office events, subscribe to our monthly newsletter and visit our office Facebook page and Blog! The Office of Sustainability held its annual clothing swap and drive in the alumni center. Social Justice Coffee Hour hosted three discussions around Aging Populations, Environmental Racism, and Food Insecurity. The Zero-Waste Corp diverted 92.9% of waste that would have gone to landfills from the TedXCharleston event. A panel discussion was held for the film "Bag It" that focused on the awareness and reduction of plastic bag use. The panelists consisted of Tim Goodwin (The mayor of Folly Beach), Lia Colabello (Director of Global Partnership at 5Gyres), and Katie Zimmerman (Program Director of air, water, and public health at Coastal Conservation League). Office interns tabled during the New-Student Orientation. Interns took a field trip to the Central Mosque of Charleston. The Romeny Urban Garden hosted a volunteer event with which the interns helped. 5 Gyres and the office partnered together to create a collabrative relationship to improve efforts and raise awareness about pollution in the oceans. Microplastics were the center of focus for the first Greenbag Lunch Series of the semester. Social Justice Coffee Hour discussed issues surrounding Mental Health, Identity, and Indigenous Rights. The office held its annual Clothing Swap and Drive, and snacks were provided by GrowFood Carolina. The theme for Sustainability Week was "The Value of Us". DIY Workshops were held demonstrating how to create face wash, toothpaste, and other common household items. Bike Maintenance Workshops were held throughout the semester teaching students common repair and maintenance techniques. The Office partnered with the Alliance for Planet Earth club on campus for their annual Waste Audit, the results of which were shown to students on campus. Recycling was the center of focus for the first Greenbag Lunch Series of the semester. Reusable water bottle refill stations reached a milestone in the Education Center with the announcement that they have replaced the use of 112,053 plastic water bottles since 2012. College of Charleston dining services served an all locally-sourced lunch in celebration of Food Day at Liberty Fresh Food Company. The Office of Sustainability hosted its first Social Justice Coffee Hour discussing Women in the Workplace. Four interns and two staff members from the Office of Sustainability attended the Association for the Advancement of Sustainability in Higher Education’s (AASHE) national conference and presented work on making the College of Charleston a more sustainable campus. The Office of Sustainability hosted a discussion around Climate Change and National Security featuring Brigadier General Stephen A. Cheney, USMC and Lieutenant General Norm Seip, USAF. The Office collaborated with the College of Charleston Center for Civic Engagement to host a clothing drive and swap as a part of Hunger and Homeless Awareness Week. Our interns wrapped up the semester by presenting the progress they made on their projects to the Executive Vice President of the College, Steve Osborne. Jim Strohm of Charleston Community Bee Gardens came to the office and talked to our interns about how to raise healthy bees. The Office of Sustainability published its Green Guide on Sustainable Living on Campus. For the second year in a row, Office volunteers participated making the College’s Welcome Back Picnic a zero waste event with 95% of the waste generated at the event having been diverted from the landfill! The Office of Sustainability handed out reusable water bottles to new students at convocation. 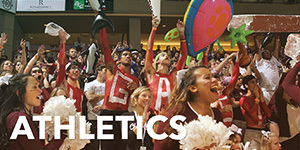 College of Charleston Dining Services published local food purchases for Fall 2014. The Office of Sustainability hosted orientation for the spring semester which included 3 part time staff, 1 Graduate Assistant, 3 Full time Employees and 26 interns from ten different majors including Communication, Historic Preservation, Geology, Political Science, Biology, Sociology, Marine Biology, Public Health, Physics, International Studies, and Arts Management. Sustainability interns and staff spoke with students at the Charleston STEM Festival in Brittlebank Park. The Office hosted its first Greenbag Lunch Series of the semester: Positive Psychology. The panel included Dr. Brian Fisher, Dr. Merissa Ferrara of the Communications Department, Department of Psychology’s Dr. Swickert and Trace Sahaja Bonner of Holy Cow Yoga Studio. The Borelli Awards for most Sustainable Chapter in 2014 were awarded. Office interns Katie Kerbel and Kelsea Sears presented on the Garden Apprenticeship Program at the Southeastern EcoReps Conference in Columbia, SC. The department of Public Health worked with the Office of Sustainability to increase recycling at their annual fair. The Office also tabled at the event. The Office of Sustainability welcomed Dr. Mark Pedelty to campus to host a Greenbag Lunch Series discussion on Ecomusicology. Working with Dining Services and Admissions, the Office tabled at Accepted Students Weekend and made the lunch zero waste. 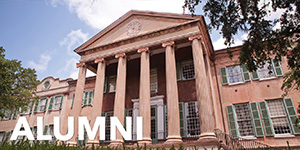 Cistern Yard named the Office of Sustainability one of the best places to volunteer in Charleston. In collaboration with Jewish Studies, the Office hosted a sustainable dinner to kickoff Sustainability Week on April 1st. Office interns Katie Kerbel and Britton Holmes were nominated for ExCel awards for their work. Facilities Coordinator Jen Jones was also nominated for staff member of the year as well. Graduate Assistant Aaron Holly won the ExCel Award for Graduate Student of the Year. The Office worked to implement better recycling infrastructure at the library. In April the Office hosted the College’s fourth annual Sustainability Week which included a week of events around the theme of “the Value of Nothing.”Sustainability Week and Greek Week Kickoff Event: Included an art walk, local food cook off and live music. The music performed was by student bands and local spoken word performers, including Clemson University student A.D. Carson. Lastly, the local food cook off included a local ingredient provided by GrowFood Carolina. Campus Waste Audit Cougar Mall: The Office of Sustainability collaborated with APE (Alliance for Planet Earth) to perform a waste audit. Student volunteers went through about ¾ of a days worth of campus trash, separating into piles: recyclable, compostable and landfill. Documentary Showing: In collaboration with the Center for Civic Engagement’s Alternative Break group, the Office hosted a viewing of the documentary Food Chains. Local Food Pop-up Lunch: Dining Services designed a dish around a locally sourced strawberries and served to students in Cougar Mall. Raj Patel Keynote: Patel’s keynote speech was based on his book, The Value of Nothing: How to Reshape Market Society and Redefine Democracy. #COFCMOVES: The Office promoted the College’s first official event celebrating the different modes of more sustainable transportation that the College community uses to commute to campus by profiling CofC staff, faculty, and students that use sustainable modes of transportation. A Midsummer Night’s Dream: The Office of Sustainability provided recycled materials for the set of Midsummer Night’s Dream. These material included old CD’s and plastic aluminum can rings. DIY Salt Scrub: This event was put on by an intern, Kelsey Deporte. The workshop taught participants the value of community through DIY. Participants were provided the materials to make their own salt scrub as well as a second one for the community partner: Florence Crittenton. Perma-Blitz! Garden Workday: Volunteers came together to get dirty at our first ever perma-blitz on campus hosted by the College's Grounds Department! We built a garden as a community-flash mob, garden style, at the Warren Street apartment parking lot. Student Diversity Conference: The Office collaborated with the CofC Diversity Office with making their event zero waste. 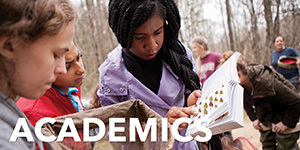 Native Bees and Hive Building: In collaboration with the Student Garden at Dixie Plantation and the Center for Civic Engagement, the Office hosted a Bee Awareness workshop. Participants learned about the endangered status of the Native Bee population and lend a helping hand by building Bee hotels. Two former and one current intern presented at the Political Science Moore Student Research Conference. Olivia Cohen presented her work on waste, Abby Tennenbaum spoke on farm labor in South Carolina, and Virginia Whorley presented her research on sustainability in Student Affairs. Sustainability Fellow Cara Lauria won the Higdon Student Leadership Center’s Cistern Award. Office intern Jenny Brennan was nominated for the Student Employee of the Year Award. The Office hosted a clothing drive and swap for the campus. In collaboration with the Department of Public Health, the Office hosted Sustainable Cycles, an informational discussion around sustainable options for menstrual cycles. The Office of Sustainability released the third issue of Synergies featuring stories and articles around the theme of Social Sustainability. Sustainability Fellow Virginia Whorley presented her undergraduate research on sustainability in Student Affairs at the Summer Institute on Sustainability and Energy’s Spring Symposium at the University of Illinois Chicago. Working with Dining Services, Alumni Relations, and the College’s Physical Plant, the Office helped to make the campus’s largest event--A Charleston Affair--zero waste for the second year in a row. 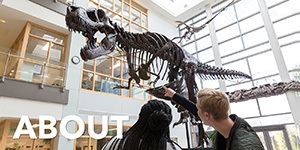 The Office welcomed our most academically diverse group of undergraduate Office interns including International Studies, Geology, Political Science, Sociology, Public Health, Physics, Arts Management, Biology, Psychology, Urban Studies, and Marine Biology. In addition to our undergraduate interns we also welcomed a new intern enrolled in the Dual Masters of Environmental Studies and Public Administration Program. Building off of Spring 2014 programming, the Office continued the Garden Apprenticeship and Sustainable Greek Chair Initiatives in the fall, taking new students into both programs. The Bike-Share expanded to 14 bikes available for students, faculty and staff. This doubles the number of bikes in the program. The Office hosted the first event of the semester: Sustainability Bootcamp. In collaboration with The Office of Student Life, the Office handed out water bottles to incoming students at Georgestock. Facilities Coordinator Jen Jones, Faculty affiliate Walter Blair, undergraduate interns Virginia Whorley, Kelsea Sears, and Olivia Cohen, as well as graduate student Aaron Holly travelled to Portland, Oregon to present at the Association for the Advancement of Sustainability in Higher Education (AASHE) Annual Conference. The Office collaborated with the Political Science Department, Carter Real Estate School, and Urban Studies Program on the semester’s first Greenbag Lunch Series: Redefining American Urbanism, held in August. The Office welcomed 21 interns for the summer semester including students from Columbia University, Georgia State University, Emory University, University of Georgia, and Wesleyan University. Interns attended field trips to Ambrose Family Farm, GrowFood Carolina, and Bees Ferry Landfill. Additionally, the Office hosted workshops around professional development and resume writing, research, and stress management. The Office started a new resource recovery program that includes consistent signage throughout multiple campus buildings including the North Campus and Harbor Walk. Collaboration with Institutional Events, Physical Plant, and Dining Services led to the first zero waste Welcome Back lunch for faculty and staff. A total of 489.5 gallons of materials were generated at the event and of that, 459.5, or 93.9%, was either composted (434.5 gal) or recycled (25 gallons). Office of Sustainability undergraduate intern Virginia Whorley was chosen to attend the University of Illinois at Chicago's Summer Institute on Sustainability and Energy. The Office released the second issue of its online Magazine Synergies. The Office hosted orientation with our new office staff on January 11th. With two Graduate Assistants, the Office expanded our program to thirteen undergraduate interns. The Sustainability Management Graduate Certificate was established in January 2014. In January, two graduate and two undergraduate students presented their projects to the Board of Trustees. Aaron Holly presented about the College’s Bike Share Program, Stefan Koester spoke about his work on the energy-saving Vending Miser project, and Abby Tennebaum and Ashlyn Hochschild presented their research on expanding CofC’s composting program. As an arm of the Urban Agriculture project, the Office established the Garden Apprenticeship Program to work with students interested in building sustainable agricultural practices in Charleston. The program includes four undergraduate students. The ECOllective Student Project Committee recruited new members to the student run project funding initiative. As of Spring 2014, around $4,500 in funds to student projects has been given out. The Office of Sustainability began Campus Conservation Nationals in February. A new specialty recycling program was started in January. Bins were installed at Maybank Hall, Office of Sustainability, Stern Center, School of Science and Math Building, Education Center. In a collaboration with the Jewish Studies Center, the Office of Sustainability helped to host the College’s first Sustainable Shabbat dinner on February 7th. The event featured composting and locally sourced food. Four new indoor water refill stations were installed in CATO, Craig Residence Hall, Physical Plant, and the Bell South Building. Additionally, the College’s first outdoor water refill station opened at the corner of Cougar Mall and College Way. In February, a student funded lightbulb exchange started in McConnell Residence Hall. The Office of Sustainability’s Sustainable Greek Chair program included 16 representatives from Panhellinic organizations, one member of NPHC, and three members of IFC. In a collaboration with the Department of Theatre Arts and Dance, the first Greenbag Lunch of Series of the Semester: Sustainability in the Theatre Arts featured a discussion with Donyale Werle, a Tony Award Winner for set design. The Fall 2013 Bike Share Report was published and promoted by Marketing. The Office of Sustainability announced the keynote speaker for the College’s annual Sustainability Week in April. World-renowned speaker and author Dr. Vandana Shiva will speak on campus on April 9th in Alumni Hall. In February, the Office of Sustainability presented the Borelli Awards for the College’s Most Sustainable Greek Chapters: Alpha Kappa Alpha, Beta Theta Pi, and Phi Mu. The Office helped to establish the Charleston Urban Growers Coalition, an organization that promotes collaboration between the Charleston Permaculture Guild, MUSC Urban Farm, Crop Up LLC, GrowFood Carolina, Compost in My Shoe, and The Green Heart Project. The Office participated in the College’s annual Sustainability Week, which included multiple collaborations across the campus and community. The Office hosted a kickoff event with Greek Life, How to Quick Pickle workshop with an area chef, campus waste audit with Alliance for Planet Earth, and hosted a keynote event with Dr. Vandana Shiva. The Office of Sustainability started the Tap That! Campaign to promote the use of water refill stations on campus. The kickoff to the campaign was co-hosted with Theta and included a documentary showing. Graduate Sustainability Fellow Alexandra Keane was nominated for the Diversity Service and Safe Zone Advocacy ExCEL Award. The Office worked with the Center for Student Learning to include two zero waste events and reusable coffee mugs to students during Cougar Countdown. The Office hosted a Sustainable Move Out with Residence Life, Palmetto GoodWill and Keep Charleston Beautiful. The initiative generated over 13,000 pounds of donations that would have been sent to the landfill. The Office released its first issue of the regional online magazine Synergies. Collaborated with the College of Charleston Grounds Department to release hundreds of praying mantises into the the urban garden; the insects help reduce the need for pesticides. Graduate Sustainability Fellow Erika Hoffman was awarded the 2014 Student Employee of the Year Runner Up. Olivia Cohen, Media Coordinator for the Office of Sustainability, released an article for CisternYard on the College’s Physical Plant and Grounds Department. Graduate Sustainability Fellow Keri Hlavin became the 2014 recipient of the Pat Kelly Award in Social Activism for her Outstanding Leadership in Social Activism. The Office of Sustainability’s graduating seniors were highlighted for their accomplishments. Former Office intern Abby Tennenbaum became the first College of Charleston student chosen for a Udall Scholarship. The Office of Sustainability collaborated with on and off campus organizations to make the College’s A Charleston Affair a zero waste event. Won a Community Award for Demonstrating Excellent Environmental Stewardship Practices from Charleston County. Thanks to the pioneering efforts of the Office of Student Life, Dining Services, and the Office of Sustainability, the Fall Family Weekend Sunday Brunch was the College's first major zero-waste event! This was a huge success for our campus, and we wanted to congratulate and thank Office of Sustainability Fellow Abby Tennenbaum and Food Waste Disposal's Heather Walbright for spearheading this enormous effort. Read the College's coverage of this event at news.cofc.edu. On October 23rd, The Office of Sustainability highlighted National Sustainability Day by joining a number of other campus organizations in Cougar Mall to help raise awareness and make connections in the campus community. Thanks to Graduate Assistants Ashlyn Hochschild and Aaron Holly for their hard work on this event and to Megan Dunn of CisternYard Media for sharing the love! The Office launched the Bike CofC website! Bike CofC is a resource and information center for all things cycling in the Lowcountry and the College. Learn about our Fall 2013 launch of the Bike Share program and much more! As a result of the success of our recycling bin pilot with the Hispanic Studies Department, the Office worked with the Honors College in August of 2013 to install personal bins in every residence hall room on campus. We hope to see continued success over the 2013/2014 academic year and to expand personal bin service to academic and administrative buildings across campus. Improving recycling and composting services at the College is a top priority for us as well as many of our campus partners including Physical Plant, Housing and Dining, Residence Life and Housing, and the Hispanic Studies Department. We officially launched the Recycle CofC website to organize our efforts! Our first Greenbag Lunch of Fall 2013 entitled Sustainable Resilience in Our Communities: Building a Better Future with Lessons from the World Trade Center was co-hosted by the Carter Real Estate School. The discussion featured co-founder of Cityvolve Jeff Baxter, CC&T Real Estate Services Development Associate Eleni Giekas, and President and CEO of Rose Associates Kathleen Rose. The discussion moderator was Office of Sustainability Academic Coordinator Dr. Jesse Baker. Also featured was locally sourced produce provided by GrowFood Carolina as well as pre-and post-consumer composting of event waste! On August 21st, the Office of Sustainability hosted a Sustainability Boot Camp featuring a lecture from our new Academic Coordinator Jesse Baker, breakout sessions on various sustainability topics led by Office staff and interns, and a number of other interactive and engaging activities. Our book share program expanded to Brown's Court Bakery. The Bike Share program received a small shout out from Charleston City Paper. Our graduate assistant Aaron Holly wrote about the responsibility that bikers have to learn the rules of the road in order to make Charleston a more bike friendly city. Our intern Lexa Keane hosted an Organic Pest Control workshop at the Political Science Urban Garden taught by Elizabeth Beak of Crop-Up. Our intern Stefan Koester worked with Residence Life and Housing to install LED lighting fixtures in several historic homes that will be monitored by the Office. All Coca-cola vending machines across campus were fitted with VendingMiser devices that drastically improve energy efficiency. Worked with several dining services on campus to expand and analyze composting efforts. Developed Building Captain program with Residence Life and Housing to improve sustainability programming in residence halls. Authored comprehensive report on a proposed green roof installation on campus. Our intern Moses Richardson of Oberlin College initiated research on a proposed Greater Charleston waste-to-profit network. Launched Greek Sustainability Chairs Program as a part of the Sustainable Greek Initiative. Passed 500 "likes" on Facebook. Hosted 3 Greenbag lunches - February: Skill Diversity and Sustainability, March: Permaculture in the Lowcountry, and April: Sustainability and National Security. Conducted Campus Conservation Nationals competition in the Residence Halls. Worked with Hanahan Middle School ECO-Challenge team to collect Caps for a Cause. Helped Dining Services conduct focus groups and surveys to determine attitudes toward food on campus. Featured in the Spring Editions of Portico and Cistern Yard. Hosted the Second Annual Sustainability Week featuring a farmers market, waste audit, greenbag lunch with Col. Puck Mykleby, bike share reveal, Making the Case for Sustainability Panel with the Business School and Carter Center, and Keynote address with Dr. Richard Oppenlander. Gave out 3 student awards through the ESPC. Tyler Hassig received an award to bring student learning opportunities to the apiculture project at Dixie Plantation, and Ashley Schnitker conducted a floral diversity study at the Plantation. Built the Sustainability Practice Network, the next iteration of the Sustainability Committee, that will work in topically focused working groups to develop the Sustainability Action Plan (SAP) over the next year and a half. Worked with Barry Stiefel and his students in the Graduate Historic Preservation Program to start working on the Historic Preservation and Building Design Chapter of the Sustainability Action Plan. Installed water bottle refill stations in 5 new locations (see map). The Office hired a second full-time employee, the Facilities Coordinator. A new batch of 6 interns were brought on board and helped us launch our Intern Development Program that provides skill development in goal setting, project management, professionalism, and leadership. Reusable water bottles were distributed to all incoming students living in the residence halls. The FY2011 Greenhouse Gas Report was published. We were featured in campus and local news for our sustainability efforts. Developed survey research at the intersection of education and sustainability attitudes and perceptions. We conducted the First Annual Recyclemania competition. Winners of the coveted "Most Sustainable" award were College Lodge for the residence halls and Sigma Delta sorority for the historic houses. Office staff assisted in making Pecha Kucha and the October 25th Donor appreciation event more sustainable on campus. Brian Fisher, our director, and Steve Osborne, EVP of Business Affairs, toured the Arizona State campus to gain insight on how ASU's sustainability efforts are impacting their campus. Office staff attend the 2012 AASHE conference in Los Angeles, California. Two staff members presented at this national conference. We celebrated National Campus Sustainability Day by screening the plenary address with over 300 institutions around the nation via internet. The Office helped to facilitate the conversation of bringing more sustainable food choices to campus by working with Green CofC , Grow Food Carolina, and Aramark during Food Week to have the first All Local Lunch. Office staff assisted Aramark in launching their composting efforts on October 31st at City Bistro by offering suggestions for marketing, speaking with students during meal times, and meeting Food Waste Disposal owner, Wayne Koeckeritz at 6am to help haul CofC's first load of compost! Three Greenbag Lunches were held: September: Climate Change and the Lowcountry, October - Energy in the Lowcountry, and November - Consumption and Culture. We launched the Speaking about Sustainability Skype lunch-time lecture series and hosted 3 speakers from outside of the College to speak about How to ACE Sustainability Education and Top Ten Reason We are Compromising the Sustainability of the Earth. We had 6 summer interns, including 4 undergraduates, 2 graduates, and two Appalachian State students. The Office and our sustainability initiatives were included in Orientation's Parent's Calendar and added to the New Student Look Book. Participated in New Student Orientation organization fair for all summer orientation groups. Purchased sustainable stainless steel water bottles for all incoming freshmen and transfer students living on campus. Toured facilities in the Charleston community with sustainable initiatives, including Ambrose Family Farm, Grow Food Carolina, and Clemson University's Wind Turbine Drivetrain Testing Facility. Created a Rain Barrel Installation Guide and painted a mural for students in the Early Childhood Education Center. Conducted an experiment looking at temperature differences between green roof panels and typical black or white roofing materials. This project and the MES Program's pilot Green Roof on Liberty Hall were featured on two local news stations. We began an energy audit on vending machines on campus in order to determine energy efficiency and conservation options. 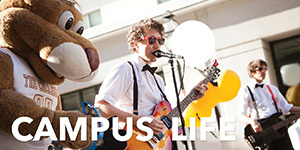 The Office published the Move-In and Move-Out guides for students living on or around campus. Designed sustainable initiatives for Residence Life and Housing. Our interns conducted a recycling and waste diversion audit with the Department of Hispanic Studies. Compiled research for our campus Sustainability and Climate Action Plans. 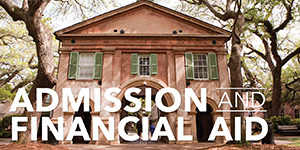 College of Charleston was appointed to Princeton Review's Green Colleges List. CofC received a grant for recycling bins around campus! Installed two water bottle refill stations; one on the first floor of the Tate Center and the other on the first floor of Maybank Hall. Celebrated Earth Day with our Panel discussion "Engineering Sustainability". The Office was featured by the Division of Business Affairs in a blog post about Sustainability Week. Check out this article where President Benson highlighted CARTA ridership at the College. In honor of Earth Day, the Office of Sustainability hosted the panel discussion "Engineering Sustainability" featuring Mary Armstrong, Hope Strode, Hamilton Davis, and Susan Collins. This event was open to all students, faculty, staff, and community members. If you missed the event, you can catch it in our Events Archive. Hosted our First Annual Sustainability Week, April 2nd - 5th at the College of Charleston. Our Transportation Expo on Monday, Apr. 2nd in Rivers Green behind the Library featured a Pedi-cab chariot race, music, and a local transportation exhibition including representatives from CARTA, Charleston Moves, CofC's new bike share and ride share programs, and much more!! Student Sustainability Day on Tuesday, Apr. 3rd featured the Local Organization Fair in Cistern Yard. This event was organized by undergraduate student organizations including Green CofC, Alliance for Planet Earth, Clean Eats, Urban Ag, and the Geology Club. Celebrating the good things that community organizations do for the Charleston Community, it featured Pet Helpers, Audubon Society, Charleston Parks Conservancy, Lowcountry Local First, various CofC organizations, and many more! Green CofC also sponsored a bottle walk to demonstrate the negative effects single-use plastic bottles can have on our world. Our viewing of the documentary Between the Harvest in the New Science Center illuminated the story of turtle egg harvesting in Ostional, Costa Rica told through the eyes of the local people and allowed us to delve into controversial issues related to natural resource use, conservation, and sustainability. Our panel discussion following the film included, film director Scott Drucker, Carlos Mario Orrego Vasquez, Lead Biologist and Director of Ostional Wildlife Refuge, SC Aquarium Sustainable Seafood Initiative Coordinator Megan Westmeyer, Assistant Professor of Political Science Annette Watson. The event was organized by Master of Environmental Studies Student Association MESSA, the Peace Corps Master's International, and Marine Biology Graduate Student Association. Pictured here are our own Colleen Sullivan and Carl Crews gathering waste to be used in the audit. For the Local Farms Fair on George Street, Pickney Gruber with Ambrose Family Farm and Clammer Dave with Lowcountry Local First set up tables to talk about eating local food. The Office celebrated this past year in the Stern Ballroom with a review of our first year followed by a discussion with distinguished environmental lawyer, advocate, and writer Dr. James Gustave Speth. The sixth Greenbag Lunch installment "Sustainable Communities" on April 5th in the Stern Ballroom brought together panelists Dr. Baird Callicott, Gus Speth, Col. Mark "Puck" Mykleby, and our own Dr. Brian Fisher. The fifth Greenbag Lunch installment "Local Food and Food Systems as Part of a Sustainable Community" on March 28th brought together panelists Nikki Seibert of Lowcountry Local First, Sara Clow of GrowFood Carolina, Lisa Turansky of Coastal Conservation League, Cory Burke of Charleston Foodtruck Federation, and CofC professor Dr. Tracy Burkett. Read more about the event on Facebook. The fourth Greenbag Lunch installment "Resiliency and Vulnerable Communities" on February 23rd brought together Political Science professor Dr. Arthur Felts and Geology and Environmental Geosciences professor Dr. Norman Levine. Read more about the event on our blog. Read about the third Greenbag Lunch installment "Occupy Earth" on January 25th on our blog. Dr. P. Brian Fisher was appointed Director of the Office. Office of Sustainability made official under Division of Business Affairs. Eleven staff members (all students) chosen to work for the Office. Four sustainability liaisons volunteered to work with the Office. The Office took part in the 2011 Carolina Green Fair. A report on transportation at the College was authored by Dr. Fisher and Dr. Erin McAdams. Members of the Office attended the AASHE Conference held in Pittsburgh. The Food Day Festival, sponsored by multiple CofC and outside community organizations, was held in The Cistern. Campus Sustainability Day was celebrated on campus with multiple events, including an unveiling of the sustainability pledge blog. Two Greenbag Lunches were held, including one with MIT scholar Deborah Cramer. View her presentation slides. Two Office projects, Bike Rack Mapping and Social Media Effectiveness, were completed. In honor of Campus Sustainability Day on October 26th, we joined with Green CofC to plan events for the campus community that demonstrate what CofC is doing to become more sustainable. Representatives of the Office in Cougar Mall encouraged people to sign the sustainability pledge(see pledge info below) and to share actions they take to lead more sustainable lives. These actions were written on large chalkboards built from re-purposed doors (pictured below). This word cloud was created based on the student responses on the chalkboard doors. The larger the word or phrase is, the more times that idea was mentioned. Click on the word cloud to see this image larger. Around lunchtime we kicked off our "Greenbag Lunch Series" inaugural installment featuring Director Brian Fisher who spoke about his vision for CofC as a leader in sustainability for the Charleston area. Students, faculty, and staff brought their lunch to this discussion and were able to ask Dr. Fisher questions they had regarding the future of sustainability at the College. The final event of Campus Sustainability Day was a film screening of "Earth Days" hosted by Green CofC. This film presented a history of the environmental movement in the United States over the last century and focused on key concepts of sustainability. If you signed the pledge to lead a more sustainable life, look for your name! You can still sign the pledge by clicking on the icon below!